Having followed the London five piece for a number of years, the release of their debut album Cannibals With Cutlery has felt like a long time coming. That's not to say we have gone empty handed though. With countless live shows throughout the year and gracing us with their delightful Word of Mouth EP at the end of 2012, not to mention the beautiful balcony sessions curated by lead singer Ralph Pelleymounter, no one can deny them having not been hard at work. From strength to strength To Kill A King have shown through their music their progression as not only a band but a bond of musicians who continue to be the genre defying group we hear today. With a strong following of fans from their continued performance of excellence the band delivers and exceeds all expectations with an awe inspiring album set to become an instant classic in anyone's record collection. Opening with the sparse 'I Work Nights and You work Days' we are eased in to the record in a rather lugubrious way. Toying with the idea of two people living in different time frames you can really feel the despair of trying to make a failing relationship work. The gentle strings and soft distraught vocals are soon left behind whilst 'Cold Skin' unfolds. Leading us in with a hazy synth loop you're soon thrown in to the soulful chasm that awaits. Surrounded by Ralph's profound lyrics vivid pictures can be pieced together. Maybe some of which encapsulate fighting your demons as we hear "We're not killing anyone except ourselves". Changing between timbre and tempo the track becomes an evolving powerhouse of energetic emotion. Now, old fans alike will recognise 'Funeral' & 'Wolves' from the earlier mentioned Words Of Mouth EP. A fine example showcasing the band's ability to draw you in through their relaxed harmonies and joyous tones yet still possess a sting in the tale, especially with Funeral's explosive ending. With 'Wolves' setting us up for the blissful 'Besides She Said' with its soft and dreamy musical ensemble the album takes a step back from the bands louder playing style demonstrating they feel equally as confident with the more delicate numbers like this. That is until 'Gasp's' unexpected outbursts of orchestral greatness tease us before disappearing back once again to their calmful origin. 'Choices', one of the longer tracks on the album at just shy of 6.30 minutes, and quite possibly my favourite, builds in the most wonderful of ways. Whilst this version doesn't feature the many musicians from Ralph's balcony series it's definitely not shy of talent. As the jittery percussion takes full hold the track has blossomed from the minimalisticly plucked acoustic guitar to a musical concoction of multi layered strings, guitars and synths packing a powerful punch. As the track rounds up on a softer note we are hurtled in to 'Rays'. A heavy guitar fuelled track that relentlessly throws all it can at you as Ralph echoes "Wash away my mistakes" as we fade on out to the blissfully soothing trumpets. 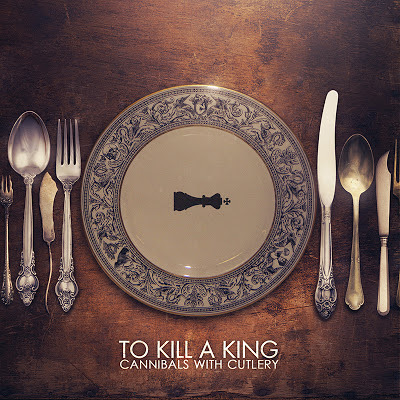 Cannibals With Cutlery is an album that has the innate ability to dip in and out of compassionate and emotional harmonies in its freest form, switching from loud to soft through crescendo's and calando's. And another fine example of their delicate beauty is within 'Children Who Start Fires'. Drifting along with ambrosial sounding guitars and a charmful percussive vibe that plods on through we're soon presented with an oldie (but goodie) 'Fictional State'. I think this was the first TKAK song I heard and it has stuck with me ever since. With its change ups in tempo and playing style it becomes a track with feeling and heart. Its almost lifelike state breathes air in to your deflated lungs with its never ending infectious charm. Moving on to the penultimate track 'Family', whilst soft at heart, it's with these gentler tracks you begin to feel an underlying emotion that hits you when you least expect. Creeping up on you from the depths of its intricate elegance you are soon surrounded by an undeniably touching warmth. Honest and Truthful. As the album rounds up with 'Letters To My Lover (The Dylan Fan)' we end on a remorseful high. With hope and prosperity the key message we're carried forward in to a state of content and somewhat sense of achievement whilst the lyrics remain as poignant as ever disappearing to a whisper of "watch the waves crashing down each one erasing me". All in all this is an acutely profound and heartwarming debut by a band who I feel have often been overlooked in the past. Finally getting the recognition they deserve Cannibals With Cutlery is sure to become a record that you can happily listen to again and again, proving to be an instant timeless classic. You can pre-order the album now via the bands webstore. The first 500 copies have been signed by the band themselves. In addition, TKAK are about to undertake an extensive tour. Check out the dates below and be sure to catch them out on the road throughout March/April in support of the release.